Between the large hemi-spherical head of humerus with shallow pear shaped glenoid cavity of scapula. This articulation allows for considerable range of movement but makes the joint unstable and therefore vulnerable to injury. 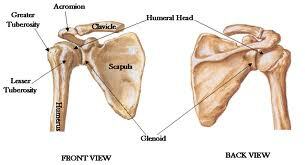 The glenoid cavity is deepened to some extent by the presence of the glenoid labrum which is a fifro-cartilaginous structure attached round the head of the glenoid cavity, the basr being attached to the bone with the thin edge being free. Synovial ball and socked joint. i) Capsule – attached to margins of the glenoid cavity and to anatomical neck of humerus. Very thin and lax (loose) and when the arm is by the side, it falls into folds inferiorly. This allows for wide range of movement. The capsule itself is lined with synovial membrane. 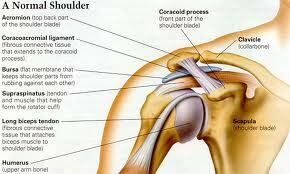 ii) Coraco – humeral Ligament – strengthens the joint on the superior aspect. Attached to root of the coracoids process and to superior aspect of greater tuberosity of the humerous. iii) Gleno-humeral Ligament – is a weak ligament attached round margins of the glenoid cavity to lesser tuberosity on the humerous. iv) Transverse Humeral Ligament – extends from lateral to medial borders of the bicipital groove. This holds the tendon of the bicep in place. 1) Subscapularis – strengthens the joint anterierly. 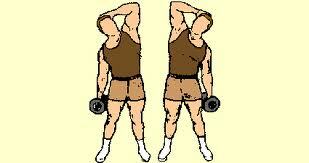 2) Supraspinatus – strengthens the joint superiorly. 3) Infraspinatus - strengthens the joint posteriorly. 4) Teres Minor – strengthens the joint posteriorly. The inferior aspect of the joint is very weak. 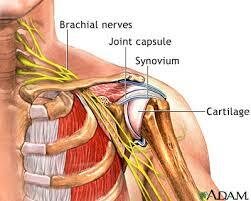 2) Tendon of long head of biceps which comes from supra-glenoid tubercle within the capsule. It emerges from capsule between the two tuberosities and descends through the biceptal groove. Ensheathed in synovial membrane which prevents friction of tendon between the bone and the transverse humeral ligament. All of the above movements combined together. This is when the arm is taken round in a circular movement.